Formula 1 returns to the Far East this week as China hosts the fourth round of the 2014 Formula 1 season. It has been Lewis Hamilton's season so far, with the Mercedes driver having won two of the first three races. On a circuit at which he has triumphed twice before, can Hamilton pick up win number three and build on his early charge for a second Formula 1 title? The Shanghai International Circuit always provides a frenetic and challenging race, thanks to its long straights, eclectic mix of corners and unpredictable weather. The 5.451km track features the longest straight on the F1 calendar, the end of which also offers the best overtaking point on the circuit. The Hermann Tilke-designed circuit's corners are predominantly low speed, some of them having an extended radius with tightening arcs, posing a real challenge to drivers. Just over a decade ago, the area where the Shanghai International Circuit currently stands was nothing more than marshland. It was converted into an F1 venue in 2003, and held its first race the following year. Located on the outskirts of Shanghai, the circuit shares similarities with the Chinese city's futuristic style. The stand-out feature is the wing that connects the main grandstand with the pit building over the track. The team bases in the paddock are arranged like pavilions in a lake, designed to resemble the ancient Yuyuan Garden in Shanghai. The main stand can hold 29,000 spectators, with the whole venue having the capacity for 200,000 race goers. Fernando Alonso (2013, 2005), Nico Rosberg (2012), Lewis Hamilton (2011, 2008), Jenson Button (2010), Sebastian Vettel (2009). Red Bull's Sebastian Vettel: "The Grand Prix in China is still something special for me, because I won my first race there with Red Bull Racing in 2009. Because of its size, the circuit is unique. The wide stretches mean there are many opportunities to overtake. Also, the large run-off areas ensure the highest standard of safety. Even the usually narrow pit complex offers plenty of space." Caterham driver Kamui Kobayashi: "The last of the four early-season fly-away races is Shanghai, a track I've always had good support on and one that's a really good challenge technically. The last time I raced there in 2012 I qualified fourth, the highest qualifying position of my career and my team at that point." 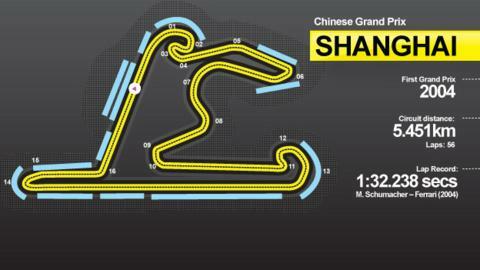 "Everything about the track in Shanghai is on a grand scale. The back straight is the longest in F1, and the never-ending first turn - which the drivers enter in fifth gear and leave in second - seems as if it was designed by someone determined to set some new kind of record for corners. "Nor is it an especially enjoyable race to attend. Although glimpses of the real China - locals on bicycles etc - are a joy, the sky is thick with pollution, which burns your throat by the end of each day. "Still, the racing, which is usually good, provides a distraction." Lotus driver Romain Grosjean: "Shanghai is not my favourite race of the year, but I will be spending my 28th birthday there so let's make it good! It's quite a particular circuit where it is not always easy to find the right setup and the temperature can also be cold. You never know what to expect, except that there will be a monster traffic jam to get to the circuit." Red Bull's Daniel Ricciardo: "Shanghai is a very open, very wide circuit but it does flow nicely and the middle sector is a lot of fun. The back straight provides a good overtaking opportunity into the hairpin but it is quite long; I always think back to when I came here as a kid in Formula BMW - massive hair and lots of enthusiasm - and trust me, then, it was the sort of straight where I'd have definitely been reaching for a book if I'd had one!" Lewis Hamilton has won twice at the Shanghai International Circuit, with only Fernando Alonso having won as many races there, but it is a venue that also holds bad memories for the Briton. In 2007, it was where his debut-season title hopes effectively came to an end. All was going well for Hamilton, who led with half the race gone. But, with his tyres deteriorating badly on a drying track, Hamilton's McLaren team opted to keep him out on the circuit rather than call him in. Kimi Raikkonen eventually passed Hamilton for the race lead - but second would still have been enough for the young rookie to claim the title. However, when McLaren finally called him in he failed to negotiate a turn in the pit lane, beaching his car in the gravel and ending his race. Raikkonen took the win and the 2007 title two weeks later with victory in Brazil. Live text commentary and all TV and radio coverage will be available online, as well as video highlights of practice, qualifying and the race.